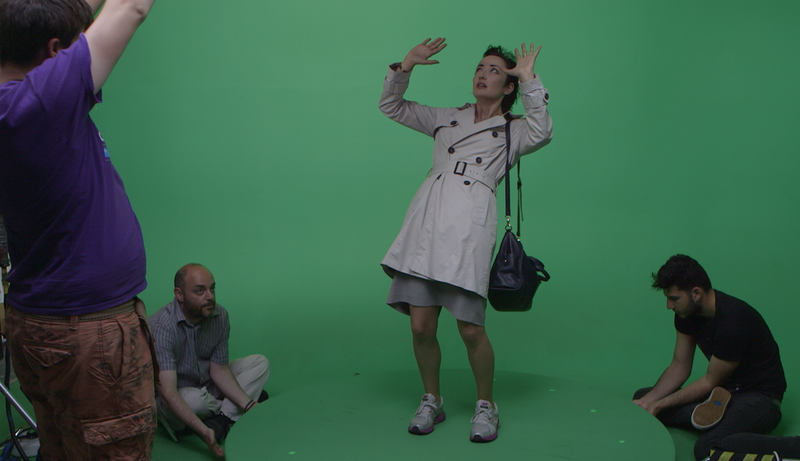 After lengthy processes of scripting, storyboarding and pre-visualization, we determined that a lot of the footage would need to be shot on a Green Screen. Having researched various green screen locations around Dublin, we opted this time around to use Film Equipment Hire in Donabate, Dublin. Their green screen studio measures 800 sq ft, with full access to important facilities like a makeup area, ample seating areas, tea and coffee plus a fridge to store our food and drink (essential for our large crew!). The Green Screen Infinity Cyclorama wall measured 23ft x 15ft, on set there were large TV screens so that we could review the footage as we were shooting – these proved to be very helpful for everyone to see and be more involved with the shoot. There was film memorabilia and various awards and accolades around the office – ringing endorsements for the work Film Equipment Hire have been involved with and the level of expertise and professionalism they have to offer. We met the very talented Lucy Jones DOP (Director of Photography), Cinematographer, Producer, Film Industry, Editor, VFX specialist and Project manager, who has worked on so many projects I would need to write another blog just to mention them all, such is the extent of her work. One of the scenes involved soldiers descending on ropes from a helicopter. As we could not physically film this, we had previously decided to build 3D models of these characters which we could later rig and use motion-capture technology to perform the action of abseiling, compositing these later into the scene. In order to get a full 360 degree representation of the soldier, we shot a sequence with the soldiers individually (Dom and Yusuf) in full costume on the 6ft Chroma-Key green rotating table, whilst myself and the crew manually rotated the table so that we could get the shots required. (We will reveal more on this process soon!). Half way through the shoot we needed extra equipment, so we hired a large jib from the nearby equipment room. There was an extensive array of equipment on offer, with everything from lighting, to audio, cameras, lenses, grips and smaller accessories to hire or buy if required. In the video, there is a car crash scene with a POV (Point Of View) shot from the driver’s perspective; this required the camera to be lifted up into the air on the jib whilst looking down at the actress. This shot gives the viewer the feeling that they are in the driving seat as the car impacts with the actress. The scene plays out in slow motion, so the appropriate techniques and software in post-production were also required. We utilised industry-standard Voronoi effects for the breaking of the glass, tracking and stabilising software to track and align the scenes and compositing software to remove the green background and adequately composite the scene. It was a great day’s shooting and overall everything went according to plan, we managed to film a lot of scenes in our allocated session. If by chance any of our own equipment failed or something let us down then we had the advantage of hiring equipment if and when we needed it. We would like to take this opportunity to thank everyone at Film Equipment Hire for all their help and professionalism and we look forward to working with them again soon. Check them out on facebook or through their website. Keep up the good work! We at GLUE intend to share our expertise and experiences of this project over the coming weeks, from Scripting, Storyboarding and Pre-visualisation, through to Production and Post-Production, all the while revealing the techniques we use to achieve the best results in bringing reality and imagination together.